another Xmas card ready to go. This guy is Copic marker, lined, and paint. It was difficult to make sure the different Browns wouldn’t blend together. 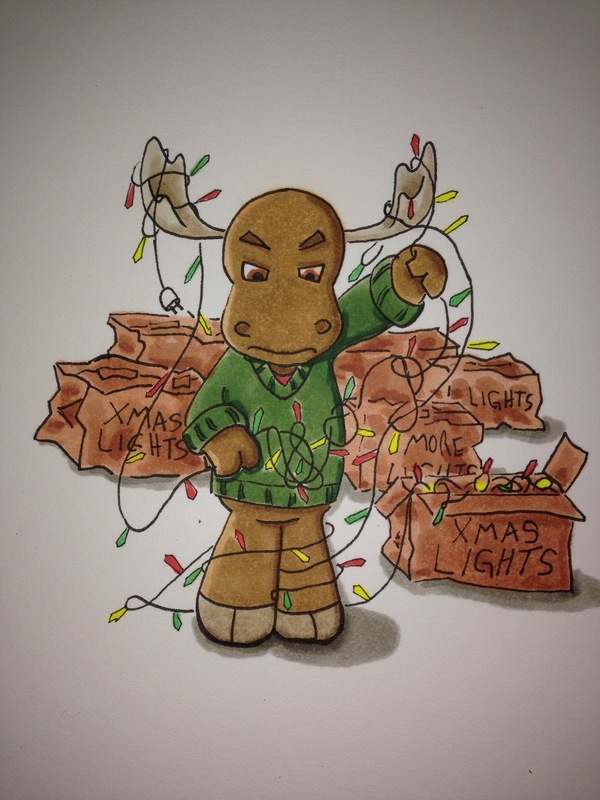 The boxes are the copic set starting with E30 the antlers are the copic set starting E40 and the actual moose starts with copic marker E53. I had a rough day at work Thursday and this guy was the result. i got space in the dealers room for fur reality con 2015 and I’m super excited. The theme this year is Viva and i’vevstarted playing with sketches. 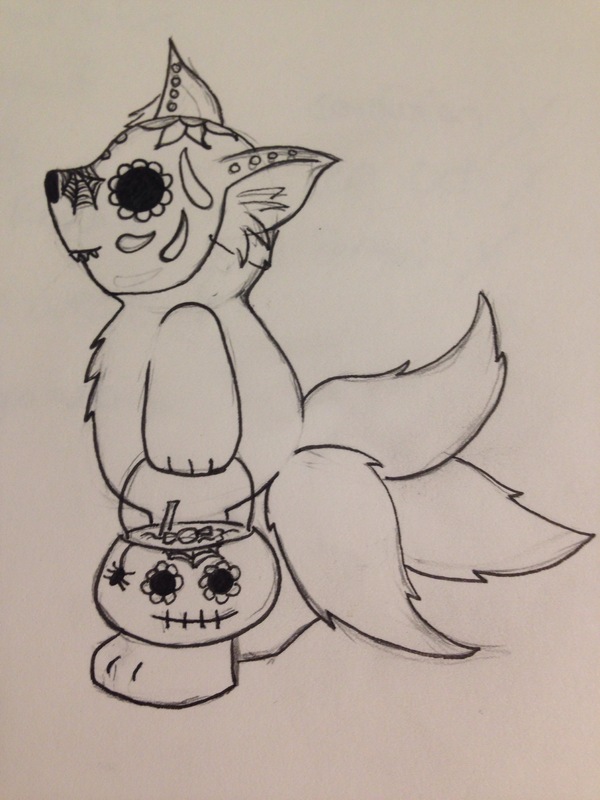 This three taled fox is all set for Halloween and the day of the dead. Would you give this cutie candy? Remember to commission a badge to be done in time for @furrealitycon . Just email me through my website and we’ll chat. 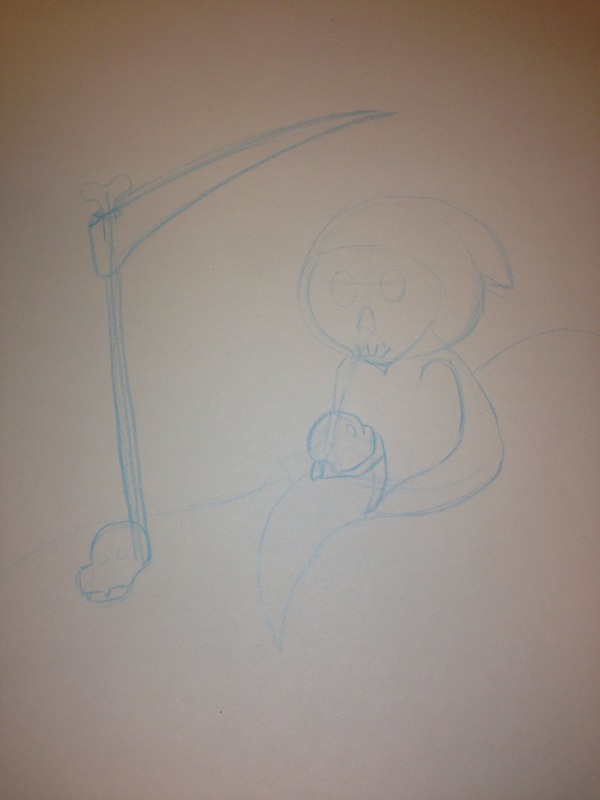 A few days ago my husband asked me for a Chibi grim reaper. Here is the work up. 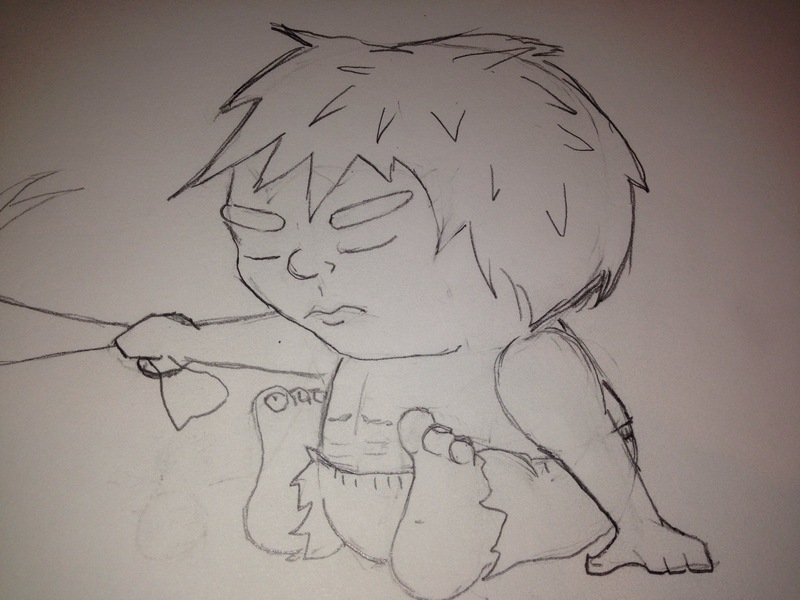 so, for some crazy reason, I decided to take the large sketch pad to work and forget my regular pencil. So alli had to draw with was a non photo blue. So this is a technique I don’t use often. 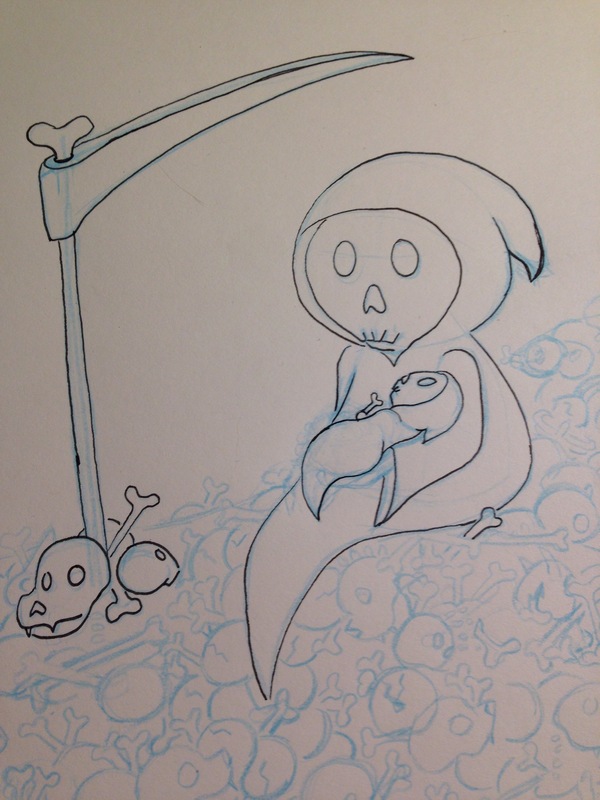 And because it’s a crap set of picks cause… Non photo blue pencil I took a min to do a tiny bit of pen work. 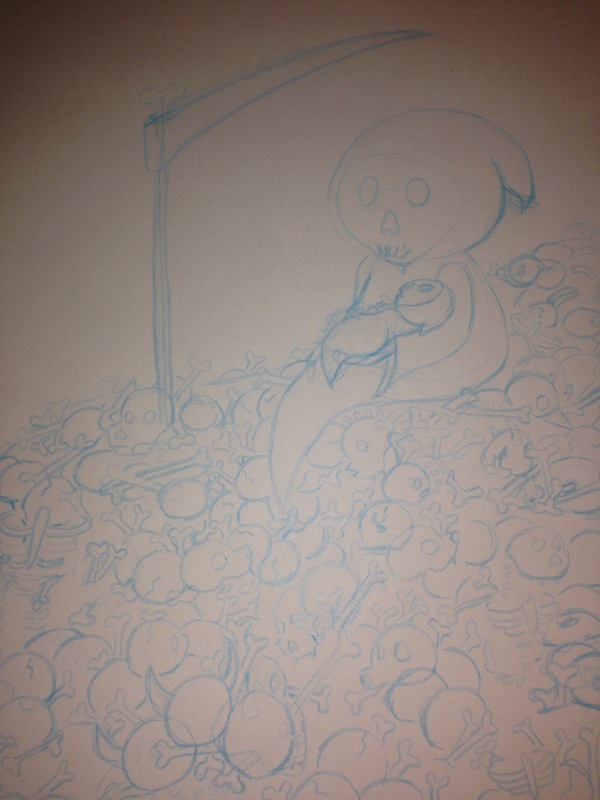 And because I’m nuts of filled in all the skeleton pile, it’s not done yet. Supplies cannon 11×14 sketch paper, non photo blue pencil, copic liner, and the grey Kneeded eraser. So many people ask me over and over “why do you talk about the holidays months out?” It’s simple really, if I’m on time for the holiday I’m late. No ones buying halloween stuff to be delivered within a week the day before Halloween. It’s really that simple. So, on that note. 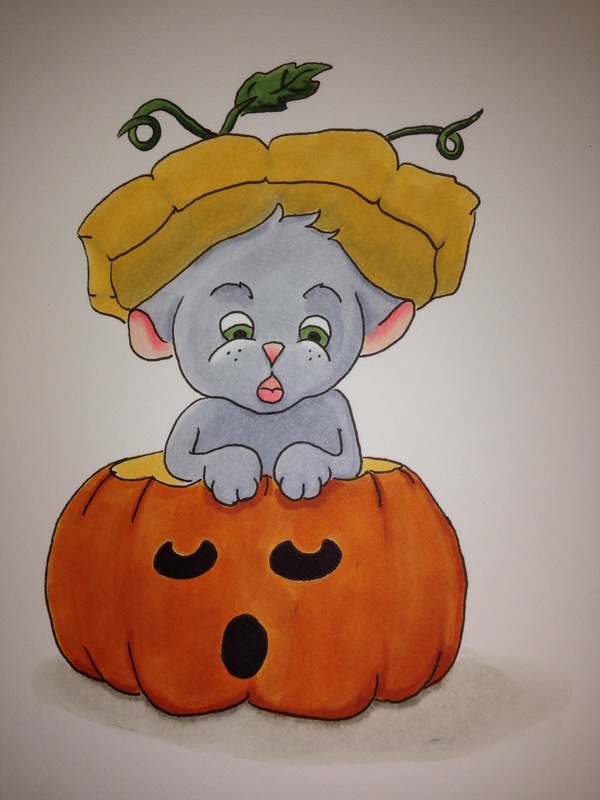 Here is a super cute grey mouse inside a very surprised Jack-o-lantern called he’s more afraid of you. Challenge two was I apparently don’t own a lot of shades of orange. Just 5 which sounds like a lot but isn’t. So supplement warm grey in cause Orange is a warm color (usually). That and the mouse had to be a different shade of grey. He’s cool grey. This was done with Copic marker and liner.